What are the qualities and requirements needed to be a pathivrata? Draupadi is considered to be one of the Panchkannyas, and a great pathivrata too. This link says why Draupadi married 5 persons (the Pandavas). Is that sacred or pure? Does it have any effect on the pathivrata state? If there's nothing wrong, according to Hindu scripture (forget current law), can a Hindu woman marry more than one person at a time? My question is, briefly explain the Hinduism and Veda perspective on polyandry. Can a woman achieve pathivrata state even though she marries more than one person at a time? I have heard in upanyasams (discourses in Tamil by Krishna premi anna) that Draupadi is a combination of 5 shaktis (pancha-shakti-mayi devi) of the 5 devas of whom pandavas are amshas (or sons). Her arrangement was of living 1 year alone with each pandava, while none of the others would enter their premises. She would do 'agni-pravesh' (entering fire) and take on new body after each year of stay before starting to live with another pandava, thus getting purified by fire. The story of Arjuna breaking the arrangement while she was in Yudhishtira's quarters in order to help a poor brahmana, and going on pilgrimage to atone for it, is well-known. Yes, Draupadi is a pathivrata. The adorable Indra became incarnate in five forms (5 Pandavas). 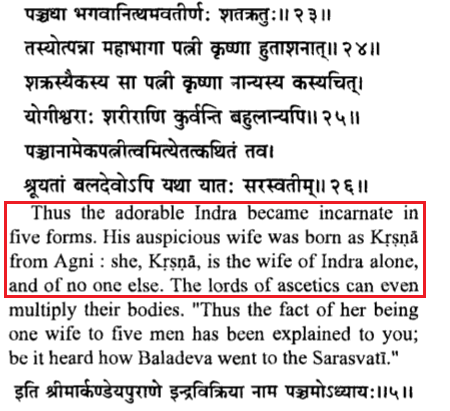 His wife was born as Draupadi from Agni: she is the wife of Indra alone, and of no one else. There are lot of mis-interpretations about Goddess Draupadi on the web, maybe because of the individual's assumptions or what they think polyandry is. In fact, She cannot be compared with anyone/ anything, nor do we have that standard to comment on Her. Please read the content in this URL and I hope you will understand who She is. "Draupadi Amman Thunai" - Meaning, may Goddess Draupadi's Blessing be on you all, always. Know more about one of the diving shrines/ temples of Goddess Draupadi in KONDAL village, near Mayiladuthurai, Tamil Nadu. Not the answer you're looking for? Browse other questions tagged mythology mahabharata dharma women draupadi . Is bribery a sin according to Hindu scripture? If yes, what is the punishment?